Chatterbait has been around for a long time but was not considered a favorite bait of the angler because it broke so easily. With recent improvements, this bait has become a favorite with many bass anglers. Just recently, Jacob Wheeler won the Forest Wood Cup using Chatterbait. Chatterbait comes in a variety of colors and sizes. This bait has the action of three baits in one. Think of it as a crankbait, jig, and spinner bait all in one. 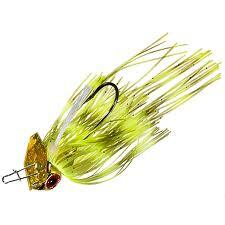 It swims like wounded prey and can be used in deep or shallow water to catch bass. The metal blade on this bait creates a flash and a vibrating noise as it is retrieved. Try using this bait on a Pflueger Patriarch rod and reel combo set. This entry was posted on Wednesday, August 22nd, 2012 at 8:40 am	and is filed under baitcasting reel, Baitcasting Reels, Knot, Lures. You can follow any responses to this entry through the RSS 2.0 feed. You can skip to the end and leave a response. Pinging is currently not allowed.